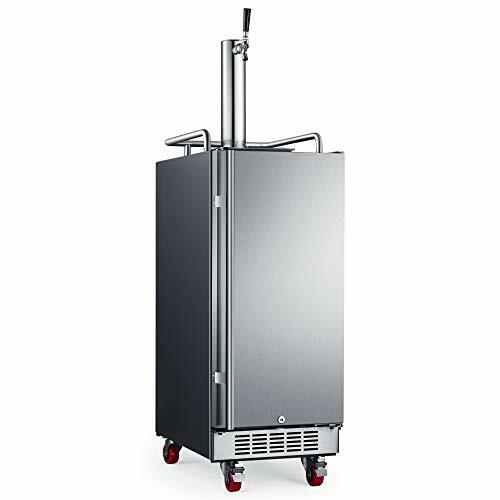 Take advantage of the EdgeStar 15" Built-In Outdoor Kegerator (KC1500SSOD) to enjoy ice-cold beer in the most compact of spaces. In order to withstand harsh outdoor elements, this beer dispenser is fully reinforced with a durable stainless steel-wrapped cabinet, and is electrically rated and safety approved for outdoor applications. Complete with an electronic control panel and forced-air refrigeration technology, the KC1500SSOD will ensure your favorite brew stays cool from keg to glass, even on the warmest of days. The KC1500SSOD features a durable stainless steel exterior and forced-air refrigeration to allow for use outdoors, making it an ideal addition to outdoor kitchens, bars, or garages. Warm, frothy beer is never enjoyable, which is why this kegerator features a forced air-cooled beer tower to ensure your brew stays cool from keg to glass. All of your settings, including temperature and interior lighting, are easily adjusted using the electronic control panel. Because of the front-venting design, this kegerator can be easily installed undercounter or built it into cabinetry for a seamlessly integrated look. Soft interior lighting illuminates your keg and components while consuming less energy and emitting no heat, so the temperature of your keg will remain uncompromised. Cold air is evenly distributed throughout the kegerator to maintain your desired temperature, eliminating possible hotspots to guarantee the perfect pour. Using forced-air refrigeration technology, You'll be able to keep your keg as cold as you please; the integrated thermostat can be set as low as 32 °F. To accommodate almost any installation space, the KC1500SSOD features a reversible door swing if you happen to prefer a certain direction or would like it to follow the flow of your cabinetry. For your convenience, this beer dispenser is capable of holding up to one (1) slim quarter keg, one (1) 1/6 barrel keg, or one (1) Cornelius keg.